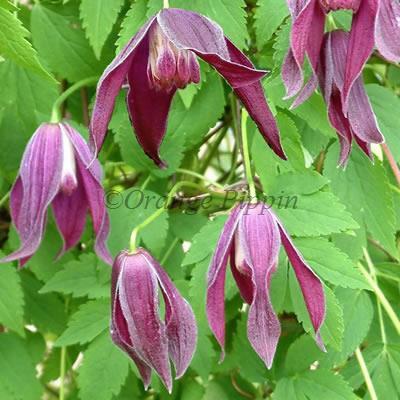 Clematis koreana 'Purple Rain' is an outstanding early flowered variety with dark purple buds that open to beautiful long, purple, bell-shaped flowers with cream and purple tipped centres during April. Of the many new varieties of Clematis which have reached the light of day, in recent years, 'Purple Rain' is perhaps among the most outstanding. In common with the alpina and macropetala types, the koreana parent of 'Purple Rain' carries the free-flowering-in-early-spring characteristic. Whilst the alpina types come from the mountains of Europe and Scandinavia and the macropetala's from the 'roof of the world' regions of China and Tibet, the koreana species comes from even further in the East. So how did 'Purple Rain' come about? Well, like its forerunners 'Blue Eclipse', 'Tinkerbell', 'Candleglow', 'Lantern Light' and 'Dark Secret', 'Purple Rain' arose in a batch of seedlings on the nursery of Mr and Mrs Vince Denny at Broughton near Preston in Lancashire. Their son was serving in the British Army of the Rhine and was stationed in what was then Western Germany. Being an old soldier himself, Vince felt quite at liberty (no one else should try this!) while strolling in a park in Dortmund to help himself to some seeds from a curious looking tangled mass of a climbing plant. Sometime later, John Richards, (a wholesale Nurseryman from Malvern in Worcestershire) was visiting Mr and Mrs Denny, when they pressed into his hands a cluster of seedlings. It was from these that the earlier varieties were selected and named. On a later visit Mrs Denny - she has since been widowed - remarked, 'Oh John, I've got a black flowered seedling of koreana, I will give it to you'. The mysterious plant was nurtured and propagated, and eventually the time came for the grand decision to be taken as to what to call it. Thus was 'Purple Rain' born. The official description is as follows: The buds are dark purple, very pointed and elongated. The magenta (RHS Colour Chart "Dark Violet" RHS 83A) flowers appear with four long sepals, each pinched two thirds of the way down. The stamens are cream, purple tipped at the ends. Flowers are small (about 50mm long) and appear in great profusion during the early spring. This non-evergreen climber can be grown along a wall, fence, arches and pergolas with adequate support for it to be trained. Where active growth is maintained by light summer pruning, successional flowering will result. Apart from this, no pruning is required. Ultimate height should be 2-3m.